When it comes to owning a successful planted aquarium, proper lighting’s essential. Without good enough lighting, your plants won’t get the energy they need to thrive and grow. 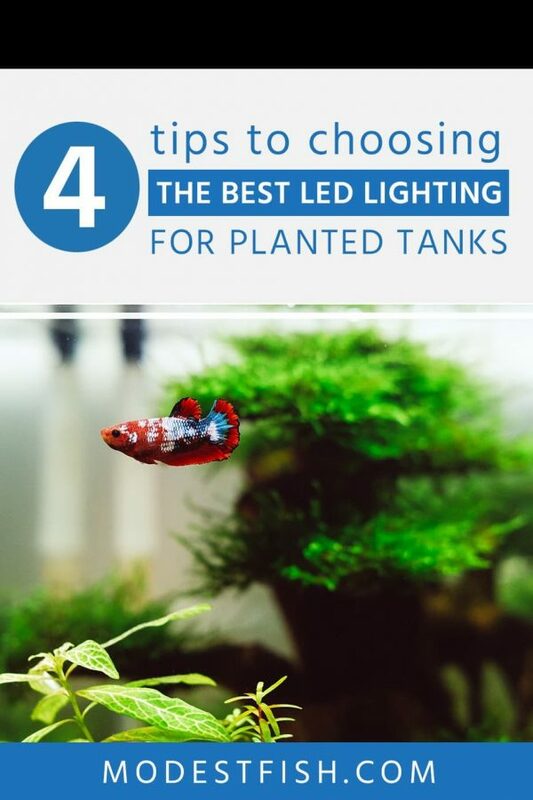 Choosing the right LED light for your planted tank can be tricky. There’s a lot of options. That’s why we’ve done the research for you. 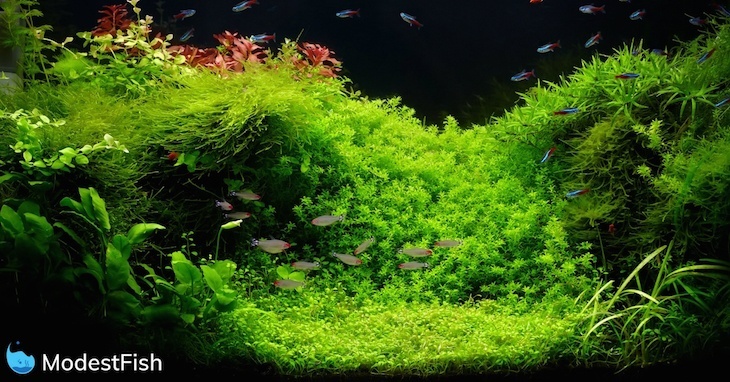 In this article, you’ll learn about planted aquarium lighting 101, don’t worry, there’s no complicated stuff, just simple guides. Then I’ll recommend some of the best LED lighting for planted aquariums currently on the market. Size Available: 5 x 5 x 10"
**Before reviewing the individual planted tank LED lights, I’d like to talk about how you can effectively choose one for your current setup. Otherwise, if you’re just here to get a breakdown of your options, you can jump straight to the review section. Does it include a timer? What plants will be or are in your tank? One of the best features you’ll want for your LED lighting system. A timer allows you to maintain consistent lighting every day. Having a consistent photoperiod (the time your tank receives light) is vital if you want a successful planted aquarium. I know… you may think, “I don’t need a timer. I’ll turn it on when I get up and off when I get home.” Yes, it’s possible. But, each day’s going to be different by 10 minutes, 20 minutes, or 1 hour! You might even forget. And forgetting to turn the light off, even once, can be devastating. You may end up spending months trying to fix that mistake. A timer is key. Whether it’s built in or you choose to buy one separately, it doesn’t matter – you definitely want one. This is the color of the light produced, and it’s measured in Kelvin (K). For example, true daylight is approximately 6500K. Plants don’t care too much about the light spectrum. I know, It’s true, they can respond to some Kelvin ratings better than others. But, plants can do well in a range from 2700k (warm colors: yellow – red), all the way up to 10000K (white light with a lot of blue in it). However, LEDs outside this range, like actinic or coral lights (the blue lights on saltwater tanks), tend not to do very well on a planted tank. Everything else… the color can technically grow plants. Although, because it can grow plants, doesn’t mean you’ll like how it looks. But, from the plant’s point of view – light is light. You might be thinking, light doesn’t quite work like that. I know. Plants see green spectrums the least – reds and blues the most. I don’t want to overload you with information, this is a 101 guide. As long as it’s not over 10000K or the blue coral light, it’s suitable. So knowing that plants can do well in these spectrums, all that’s left for you to do is pick a color you like. The most popular choice for hobbyists tends to be around 6700K (the same as the sun). The taller your tank, the more power you will need. If you shine a normal flashlight into an aquarium, every 4” of water will take a flashlight twice as strong to keep it the same brightness all the way down. So, if you’ve got a 1-foot deep tank, you might get away with having a low-powered fixture and still achieve a medium light. But, if you then put that same fixture on a deeper tank, it’s going to put you in the low light category. 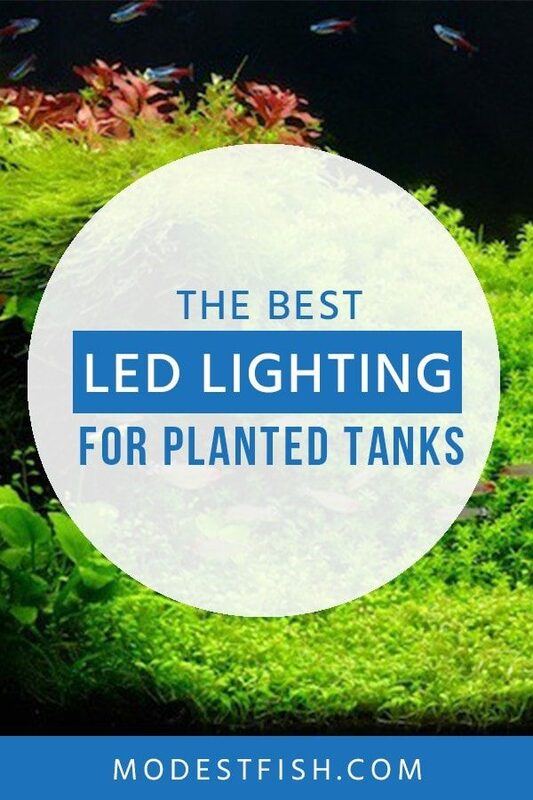 Now, if you put a powerful LED fixture on a 1-foot deep tank it’s going to be so bright, it might actually be difficult for you to grow plants. Because you’ll have to put so much fertilizer and CO2 in your tank to combat that much light, it could actually hinder you. This is the case if you use a light fixture that’s way too powerful. Because of this, having a dimmer on your LEDs is always a nice feature. It will allow you to adjust the light intensity according to the depth of your tank and type of plants you own. 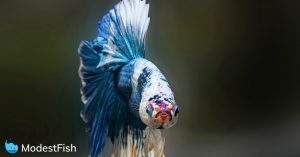 What Plants are in Your Tank? It’s important that you understand the type of plant life you have in your aquarium in relation to it’s depth. Different plants will need low, medium, or high light intensities. Again, this is why it’s always nice to have a dimmable feature, as it allows you to adjust the strength. And if you decide you want to change the contents of your tank, you won’t have to buy a new fixture. Designed for planted tanks, it uses a 24/7 automated system that allows you to mimic the Sun’s natural movement across the sky. This will run on real time and repeat daily. If you don’t want to use this, you also get four memory card slots. Where you can save your favourite color combinations and lighting intensities. It includes dimmable red, green, and blue LEDs, as well as 7000K daylight LEDs. You can control everything with the remote. Including the option for custom weather settings: thunderstorms, sunny and cloudy days etc. You can choose from five sizes: 20”, 24”, 30”, 36”, and 48”. The legs can also adjust, allowing you to optimize the length. This is a great option for low tech, mid tech, and show tanks. 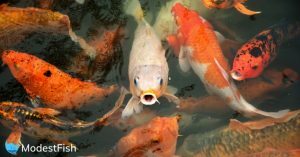 Summary: A truly automated system for your freshwater aquarium. It will mimic natural daylight throughout the day from sunrise to sunset. A great option for both experts and novice hobbyists. It offers easy to use advanced features. Featuring a simple bright LCD timer on the end give you quick, easy access to all the programming and timing functions. The 3-channel timer allows you to control the white, mixed color, and moonlight LED’s independent of each other. You get more color combinations and lighting which replicates daylight, sunrise/set, and moonlight. You’re able to customize the ramp up and fade between 10 minutes and 2 hours. The backup battery will save your settings if it loses power. This light comes in a 24, 36, and 48” light strip, and it’s very good looking. An acrylic cover lens protects the lights from accidental water spray and condensation. Improving the lifespan and durability. 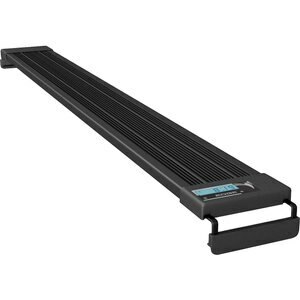 Summary: The Aquatic Life EDGE offers easy to use advanced features, making it good for both expert and novice aquarists. A popular lighting system, the slim design is available at 17″. The legs will also adjust, allowing for a secure fit. The fixture includes 6500K white and RGB LEDs, providing you with the full spectrum of light. The controls are very easy to use and includes lunar and daytime settings. The integrated timer allows for a consistent photoperiod. Dispersion lenses on the LEDs help to properly blend the light, dispersing it evenly throughout your tank. The 6500K LEDs feature a polycarbonate lens, which adds a nice natural shimmer. The ease of use and features available make this suitable for both beginner and seasoned hobbyists. Summary: Nothing over the top here, the Marineland LED fixture provides the full light spectrum for a budget friendly cost. These LEDs aren’t like the others on this list. Kessil design and manufacture purpose built LEDs, and have been for over 27 years. This ability to control the tech from the start with a specific purpose in mind sets them apart. The materials used to make this LED fixture is durable and means it’s got a high chance of lasting a very long time. Featuring two control knobs, you can control both the light spectrum and intensity. Meaning this light can adjust to different tank depths and plants lighting needs. The controls a very easy to use and could be a fantastic option if you’re not the most tech savvy person. You’ll also get the added ability to daisy-chain multiple lights, which you can control from a stand-alone controller. Summary: Top of the line wide angle LEDs offer quality results. Easy to use and program, this is one the best lights available today. The Finnex and the Aquatic Life. If it’s in your budget, I would say go for the Aquatic life. Yes, it’s slight more expensive, but you’re getting a better build quality. However, having said that. The Finnex is more than capable of providing the light you need and any other customizable options. It’s also much cheaper. A truly automated system for your freshwater aquarium. It will mimic natural daylight throughout the day from sunrise to sunset. I love this review! I’ve read others that can’t muster the technical aspects of light and growing plants. But you’ve covered all the important stuff. What other lights did you look into? Have you looked into KZKR? I’ve heard their name before, but I can’t remember if they’re any good. And thank you for including a date at the bottom of the review. It shows you care about relevance. Thank you so much for sharing the information and reviewing the products in specific. It was really a good read. It was well laid for a laymens understanding. I could make up my mind in deciding what to go for. Though I would research on it further, you review definitely gave me a good understanding. After many years of planted aquarium hobby finally have a clear idea about light. Great review, definately will help many people like me. Thanks a lot.